Picking mineral-rich weeds like dandelion, clover, chickweed, and plantain is a great way to round out your nutritional intake during the spring, summer, and fall. Doing this is harder during late fall and winter when there’s a dearth of new growth, but there is a way to enjoy the vitamin and mineral-rich nutrition and preventative health benefits of wild plants all year round: Put them in storage! There are a number of ways you can store various crops, including the nutritious, mineral-rich weeds that are first to come and last to leave in the yard and garden. But why not go a step beyond putting away food and create your own multi-vitamin and mineral supplements to help keep you healthy and well-nourished through the winter months? After all, nutrition is more than just calories; you have to have the right building blocks in the form of vitamins and minerals, too. That’s one reason why people spend big bucks on multi-vitamins, but if you’ve got weeds in your garden you don’t need to. Many plants can be frozen or dried and stored for winter use, but you can more fully enjoy the benefits of your weed “vitamins”, as well as know they’re safe from dust, moisture, or power outages, by storing them in tincture form. Tinctures are basically ready-made tea in concentrated form, but since water-based extracts of herbs (typical tea) won’t keep for more than a few days in the refrigerator you should create your tinctures with a vinegar or alcohol base. I like to seal mine into sterilized glass jars so that I don’t have to worry about whether they’ll keep all winter long or whether a bottle that hasn’t been sealed might get contaminated. The heat that comes from processing them in a hot-water bath also speeds up the solvent process that extracts the vitamins, minerals and phyto-nutrients from the plants into the vinegar. If you didn’t subject them to heat at all you’d need to turn the tincture jars over periodically, letting the ingredients mix, for six weeks or more before they were ready to use. By sealing them in a hot water bath you can get away with just tucking them into the refrigerator or a cupboard and using them as needed. The first time I ever dug dandelion roots was in the middle of a huge dandelion fight. What had started as innocent flower flicking turned into a full-on battle with whole dandelion plants, roots and all, being tossed back and forth. I might not have participated if I’d known that I was basically throwing multi-vitamins; lobbing a little vitamin A, B, and C at your buddies doesn’t sound like half as much fun as just throwing flowers. We were lucky with our dandelion pulling back then, because the soil was very loose and the plants very healthy, their robust roots came out of the dirt with the stems, looking for all the world like upside-down Easter trees. Odds are good that when you head out to dig dandelion roots for a vitamin and mineral tincture you’re going to have to put more work into it. 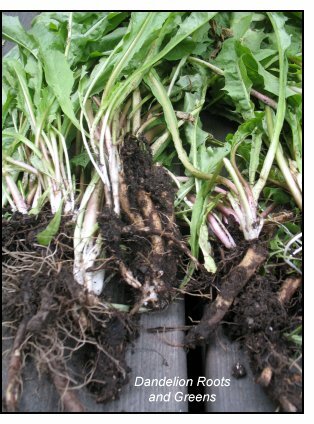 While some people recommend digging dandelion roots with a full-size shovel, this can leave you with a pot-holed moonscape in no time, where once you had a yard or field, and makes it hard to get a close-up look at how healthy the plant is before you dig it up. I find that digging dandelion roots with a sharp hardened steel hand trowel is much easier and, in the end, gets you more root for less effort. This past growing season has been so dark, wet and just generally miserable in some places that many a gardener has been found curled into a fetal position, clutching the wilted remains of their crops and sobbing. Even the weeds, which tend to flourish when cultivated crops do not, have had a hard time of it; when I headed out to gather what used to be a bountiful crop of dandelions and clover in my yard I found that between the resident snowshoe hares, an invasion of slugs and other pests, and a fungus that capitalized on the moist conditions, there wasn’t much left for me. 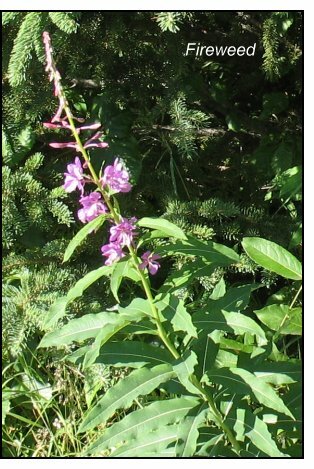 If, like me this year, you don’t have healthy “weeds” to pick on your own land, or if you’ve spread chemical fertilizers or insecticides over the area you otherwise would have liked to pick in, you can always ask a friend for their weeds. While most people are bemused by requests to harvest their dandelions or chickweed, they’re almost always happy to have you come in and carry away what they’ve been probably been trying desperately to get rid of anyway. Having found a neighbor willing to share the healthy crop of dandelions, clover and plantain in her chemical-free yard I packed up my trusty trowel, a pair of gloves, and a couple of bags to store my catch in and hurried over. Just like with cultivated plants, picking or digging up a weed is almost like pulling the plug from a sink—the vitality starts draining out of the plants immediately. Knowing this, I made sure that what I needed for storing my harvest (clean glass jars with two-part lids, a pot large enough to seal them in a hot water bath, and a rack for them to sit on in the pot) was ready before heading out and that I had plenty of time to take care of the plants once I got them home. Once I started digging the dandelion roots I found that when working in firm soil it’s much easier to loosen the dirt around the plant with a trowel than to dig it up directly. When going direct it’s all too easy to chop the top of the plant from the root by mistake, which makes it nearly impossible to get the rest of the root up. I learned to grip the base of the largest, healthiest looking plant in one hand while I worked the trowel around it in a circle, loosening the dirt; then I worked my hand down the root as far as I could, making sure that I was digging along the root and not across it. Dandelion roots will go straight down into the ground given the opportunity, but obstacles like big rocks or having been cut off by over eager diggers can leave them crooked. Again around the root with the trowel, then again reaching into the hole, and before long I lifted the dandelion, root and all, straight out of the hole. 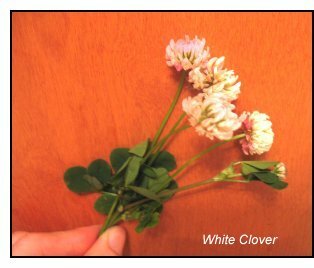 For clover I snipped healthy-looking leaves, stems and flowers that weren’t showing any signs of dying back or fungus blight. Just like you wouldn’t want to eat meat from a sick animal, it makes sense to choose the healthiest plants for keeping yourself healthy, doesn’t it? I put the clover flowers, stems and leaves into another bag together; while some might find them hard to digest raw, they are edible. A small, sharp pair of scissors came in handy for snipping clover stems since they can be a little tough. I could have differentiated between red clover and white clover by looking for the distinctive “V” on each red clover leaf but didn’t bother since I was picking for nutritional purposes, not medicinal. So long as everything I got was edible I didn’t mind mixing similar plants. 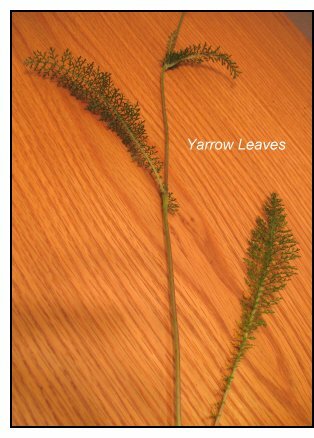 Plantain was the easiest of all to pick—I just pinched the broad, fleshy leaves off at the stem with my fingernails. These are my all-time favorite salad green and, like the other weeds I’ve mentioned here, are useful medicinal plants as well. I’ve heard that plantain doesn’t dry well because of its high moisture content, but it’s a perfect candidate for being stored in tincture form. My neighbor didn’t have any chickweed—neither, as a matter of fact, do I—but that is another common weed that invades cultivated soil and is easily stored in tincture form for medicinal or nutritional use. Once I’d secured enough dandelion, clover, and plantain to suit my needs I headed back to “the laboratory” to begin processing my catch. The clover and plantain, because they’d been harvested above ground, went right into a sink full of water and a little food grade hydrogen peroxide to clean them off while I separated the dandelion greens from the roots and set the greens aside to receive the same treatment. The dandelion roots took a little more work to prepare. I started the cleaning process by dumping them in a bowl of water and agitating them, changing the water as it muddied. After going through a few bowls of water the roots each received a brisk hand-scrubbing on the way into the same diluted hydrogen peroxide bath the greens endured, then the final crevices were scrubbed clean of dirt with a clean toothbrush and the roots laid out on clean paper towels. The rest of the jarring process was very simple: I sterilized the jars in batches and then filled each about a quarter full of edible weeds and/or dandelion root, chopped into small pieces. I saved a few small jars of individual herbs for medicinal uses, but for the most part I was very free with my mixing since, after all, the point was to create a nutritional tonic to fill in vitamin or mineral gaps in my diet. Once I’d sorted the herbs into sterilized jars I filled each jar up to the threads (leaving a little head space) with my chosen tincture base. I prefer using apple cider vinegar because it’s a natural product made from fermented apples and is considered by many to be a restorative tonic on its own merits. Apple cider vinegar also has a lot of acetic acid, which acts as a powerful solvent to extract the nutritive qualities of the plants in a tincture. Acetic acid is also a natural preservative. Other possible tincture bases include white vinegar (which in many cases is nothing but a pure chemical-in-water solution) or alcohol, which is the perfect preservative and a good solvent, but not as good as vinegar. Using apple cider vinegar, or any other natural vinegar, has the side effect of creating a new culinary product as well: You can use the herb vinegar you produce anywhere you’d use vinegar in your usual cooking process; how’s that for a novel way of taking your vitamins and minerals? Once the tincture jars were full all I had to do was screw the two-part lids on and put them in a hot water bath for about five minutes. Once they’d all sealed (as with all jarring listen for the “ping” or look for the raised dimple on the lid to get sucked in), I put them away, clearly marking which herbs each jar contained and when they were harvested. Once you’re ready to use the tincture it’s as simple as breaking the seal on a jar and sipping a few tablespoons each day; exactly how much you take depends on how strong the mixture you made is, how potent the herbs were, and how much body mass you have. If you know you’re deficient in one or more vitamins and minerals, you can tailor which herbs you put in your tonic/tincture formula to suit your needs. Here’s some information to help you decide what you need. Keep in mind that wild foods, including herbs and edible weeds, are an excellent source of many trace minerals that we don’t get from other processed food sources. Dandelion is rich in calcium, iron, magnesium, manganese, phosphorus, potassium, selenium and zinc. It also contains vitamins B-1, B-2, B-3 and C along with beta-carotene, which your body turns into vitamin A. Red Clover has calcium, iron, magnesium, manganese, phosphorus, potassium, selenium, and zinc as well as vitamins B-3, C and E.
Plantain is rich in potassium and vitamin A.
Chickweed has calcium, iron, magnesium, manganese, phosphorus, potassium, selenium, silicon, sulfur and zinc as well as vitamins B-1, B-2, B-3, C, and E. Chickweed is also a rare plant source of essential fatty acids. When you’re gathering herbs (because that’s what dandelions, clover and such really are—not weeds) take care to pick only those plants that you know, beyond a doubt, are absolutely safe. Make sure to stay away from areas that have been treated with chemical pesticides or fertilizers that may have been taken up by the plants, as well as places that are downhill or downstream from contaminated sites (old mine sites, home foundations, near roadsides or where vehicles are parked). You should also be careful if you have a severe hay fever allergy, as some herbs (like clover) may trigger it. Homemade Applesauce: Accept No Substitutes!